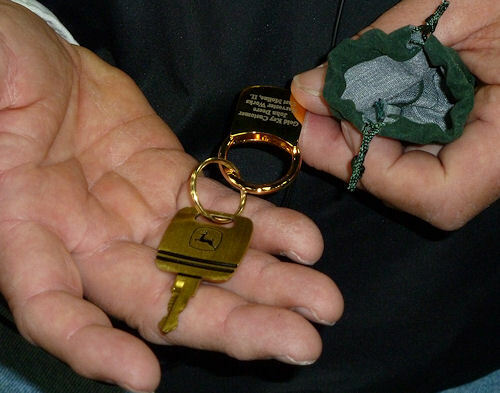 John Deere pushes first Gold Key delivery and talks 'Can Do' too. 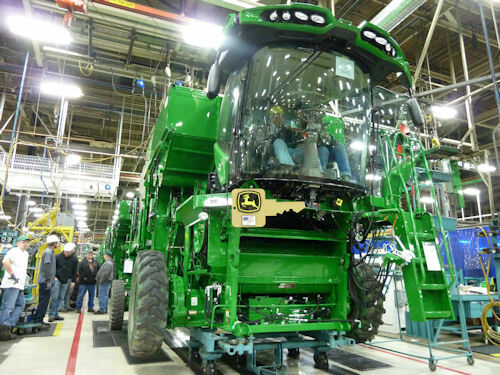 Editor's Note: This is an analysis and commentary piece based on a tour of the newly updated John Deere Harvester Works. The plant has been retooled to start production of the new S Series machines and this story profiles the tour, the farm family who took it and a few other ideas Deere had for media visitors. When a significant update/redesign is made to a new product, a company wants to make a statement and call attention to itself. For Deere, the big change is the new S Series combines with a new cab, enhanced threshing capacity and the largest engine in the combine business. So how did they make a statement? In a few ways. 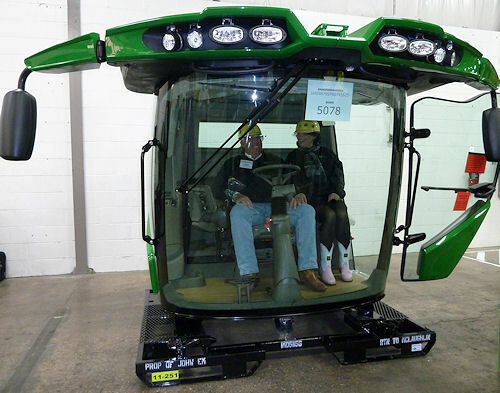 FANCY NEW OFFICE: Bob and Katie Herring check out the cab for their new S 670 Combine, which Deere was able to pull from the line for them to check out (a rare occurrence). The expanded cab will be a favorite for Bob's grandsons. First, working with the John Deere Foundation, Hy Vee and about 700 volunteers the company has constructed - or "canstructed" - an S Series Combine out of about 320,000 cans and 15,000 bags of dry beans and popcorn. It's an impressive site (see the image on this page) and involved quite a lot of work. You can learn more the Farmer Iron Blog. Second, the company brought in its first Gold Key customer tour family. Robert Herring, Mechanicsville, Iowa, was the first to do the official buyer's tour through the new combine line. Herring, wife Katie, their extended family, employees and representatives from the dealership all came on the tour. It was a big group. REALLY GOLD KEY: The John Deere Gold Key program really does involve a gold key as Bob Herring shows here. For those readers who don't know about the Gold Key tour, it's a long-standing program at John Deere, that customers can come in and tour the plant when they buy a machine. Herring says he's done a few Gold Key tours in the past - but this one got him more attention. To cap off that event, Herring placed the last can into the Can Do combine can sculpture - a symbolic gold key can that he placed during a news conference as part of his tour. For veteran plant tour people (the author is one), a trip through a combine plant isn't a new idea. However, there have been some key changes at the John Deere Harvester works. For example, where the company once built straw-walkers for combines it now builds the new 600D Draper Platform in the space. Deere stopped building straw walker combines back in 2006 at the Harvester Works. Another area with some change is the cab line. Deere was receiving assembled cabs from McLaughlin Body Company, but today the company assembles the cabs at the Harvester Works. McLaughlin still builds the frames. From the images you can see on this page, the Harvester Works is going full out, and the Gold Key tour was a highlight for employees too. A range of them talked to the Herrings on key stops, everyone waved at the tour as the tram went through the plant (a custom at Deere). And as they say a good time was had by all. FIRE IT UP: The Gold Key Tour includes the chance to be the first farmer to fire up a combine on the line - a machine that's been loaded with fluids and is ready for a test firing. It's a first-start effort that Deere is confident will work. No hitches this time, Herring got a quick turnover and a smooth running start. The Harvester works, which employes about 2,100 workers - including 1700 line employees - can "produce all the combines it needs" according to the tour guide (the company does not release capacity figures). Based on the line and the parts on hand, the company is pushing the new machines out to the market. An important part of the Gold Key tour is the chance for the farmer-customer to receive a gold key and start up a combine on the line. For Herring, he got to start a combine - but not his - instead it's a symbolic event that gives him the ownership experience. The unique aspect of this first-time S-Series tour is that the company had the cab for his combine assembled, so they pulled it from the line and Herring, and Katie, got to sit in the new operating space. It was a unique event, even for Deere. The Herring operation - Bobkatacres - is about 7,000 acres near Mechanicsville, Iowa. Herring has purchased an S 670 which will join the fleet. He uses two combines for corn harvest, and for soybeans, he adds a third harvester to keep up with the load (usually rented from a local dealer). And now Bob Herring is the proud owner of a new S Series combine along with a gold key to go with it. You can learn more about the S Series combine in this audio interview conducted by Jason Vance for Farm Progress Radio - check out S Series Combine.